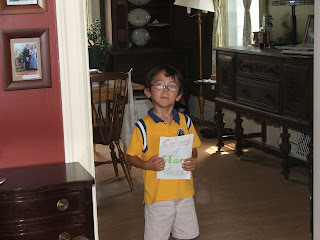 We had our summer homeschool receitation day on Wednesday. It was quite a success with nine children presenting everything from musical pieces to a snake display. The theme for the day was "colors." 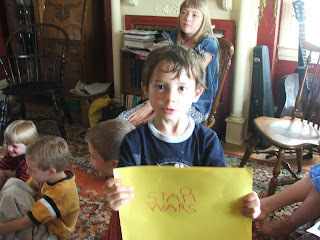 James and Isaac each created a book about the colors of Star Wars which they read to the group. For my kids, homeschool receitation day is not that fun. The idea of standing up in front of other kids and adults to present something scares them. But I saw a big improvement this time around. James eagerly asked to read his book after only a couple children had gone. Isaac still needed lots of encouragement, but he read his book without tears.